Ansley Designs: How to Dye Upholstered Furniture! So I actually bought two matching vintage tufted cane chairs off of Craigslist. The sweet lady actually recognized me from the blog! I was so flattered. She thought I painted the chair, which probably lots of you think that. The idea of painting upholstery was one in the back of my mind forever. It seemed way easier than reupholstering a chair, but at the same time having to paint it on in layers, etc etc. It seemed like it would take a long time and I just didn't want to do it! OMG IT WAS SO EASY! I mixed a cap full of RIT dye with 1.5 cups of HOT water! First I tried painting it on with a brush. Dip it in the dye, brush it on. I could have just painted it at the rate this was going. So, I put the dye in a spray bottle and just soaked the upholstery! Now everything will drip like crazy, so I don't recommend doing this unless you are planning on painting the wooden parts...or if you are lickety split at wiping the drippy dye off...but then more drips! I recommend putting a towel on your floor. :) Doing it outside would be best, but it was in the middle of the night when I did mine! Go figure! I also recommend wearing gloves so you don't dye your skin! Anyhow, all you really have to do is spray it on and saturate the fabric. Let the chair dry over night. It was still a little damp in the morning, so I set it out in the sun for just a couple of hours and it was ready for paint. The white on the arm is where I had to make a repair. For painting, be sure and cover every, single, bit of fabric with news paper! I was a little sad to paint it because I thought the blue went beautifully with the brown frame. However, there was a big chunk out of the frame. So, I had to paint her. Then just use spray paint to cover the wooden areas! Check out my spray painting tips here! Anyway, there you have it. Don't reupholster your pieces, dye them! Check out that cute damask side table here! The dye will not bleed on your DRY clothes. I put a WHITE pillow case on the chair for about a week with some big books stacked on top of it to add weight. The pillow case was still white! However, I did a test area with a damp paper towel (I let it sit for half the day, weighted down), and there was some color on the towel. So, just don't sit on your piece wet! Or you could try rinsing/washing it when you're finished. The fabric is still soft. It does not change the texture of the material one bit! Next I want to try going from a darker color to a lighter color! Wish me luck! 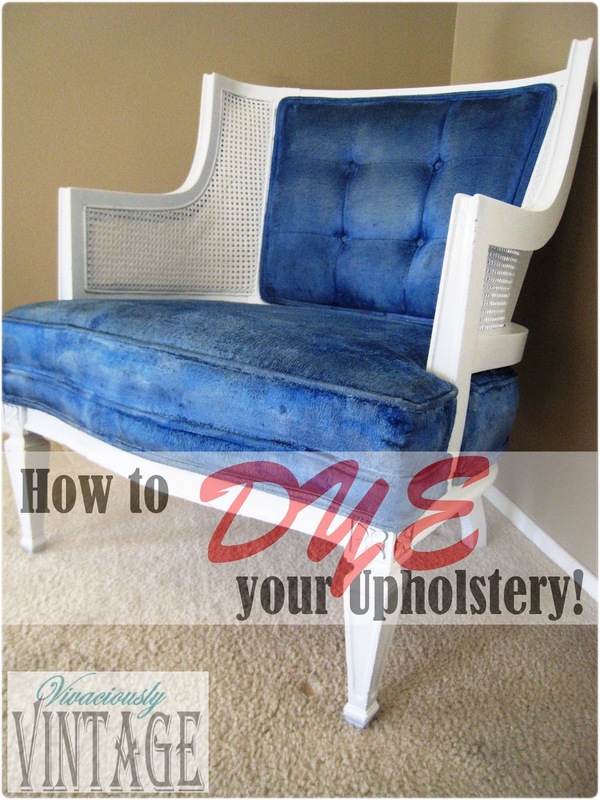 You definitely should - it's so easy compared to reupholstering and faster than the painting tutorials! Did you ever experiment with going from dark to light? I've been thinking about trying this on a gray chair but it's too dark for the color I want it to end up ... so any advice would be welcomed! Have you experimented with dyeing from a dark color to a lighter one? I was looking for info on this and can't seem to find much! I am totally loving this idea.......Cheap and easy just the way I like it! Oh my goodness!!!! I am so going to do this. I have an old rocker that I picked up for $5 years ago. I don't really like it, but it has such pretty lines that I can't get rid of... Didn't want to spend then money to reupholster, but couldn't bring myself to part with!!!! I will definitely be dying and painting!!!!! I want to change the color of my "white" sectional. I have young boys so it now appears dirty and stained even after cleaning with the upholstery attachment on my carpet cleaner. I'm thinking dye would be best as I could dye the cushion covers in the washer then use your spray bottle technique for the upholstered frame. Any suggestions, tips or ideas would be appreciated! Im looking for tips on dyeing a "white" sectional. I have young boys and it was free from my mother in law but the thing always looks so dirty and digusting. I've tried to clean it with my carpet cleaner but the results are short lived. I checked out the fabric paint but its costly. I was thinking dye might be easier as I can put the cushion covers in the washer to dye them then spray dye the remaining upholstered frame. Do you think that would work or have any useful tips? I'd love to see how it comes out! Email me photos! I'm in the process of doing this now and I'm super confused about the rising step.....so is there no need to rinse the dye out? And it will NOT transfer to clothings, right? Any advise would be appreciated. Hi Leslie. There is no color transfer on dry clothing. However, I just did a test area today with a damp paper towel, and there was a bit of color on the towel. So, just don't sit on your piece wet! Or you could try rinsing/washing it when you're finished. There is always the option of using washing the final project with a steam cleaner such as "little green cleaning machine" by bissell. This sound perfect as I have a lovely little rocker that I want a different color and cant see reupoulstering something that is sound in fabric, just needs some freshening up. I am looking into dyeing a white couch inwas given that is stained. I know this might sound taky to ask, but have any of the clothes been damp "like sweting or just in out of the rain" of the people that have sat in the chair? It seem to me like that would be the way to make it bleed onto ones close and is my only concern about doing this. No, but I can dampen a pillow case and put it on there with some weight to test it out! I'll get back to you! Sweet! That would be great thank you. I just did a test area today with a damp paper towel (I let it sit for half the day), and there was a bit of color on the towel. So, just don't sit on your piece wet! Or you could try rinsing/washing it when you're finished. Does this change the texture of the fabric at all? Not one bit! That's why I love it so much! Will sitting in it wet make the color bleed? There is no color transfer on dry clothing. However, I just did a test area today with a damp paper towel (I let it sit for half the day), and there was a bit of color on the towel. So, just don't sit on your piece wet! Or you could try rinsing/washing it when you're finished. That was smart of you to test a swatch! I always dive in head first!!! I dyed the chair late at night - so it dried overnight, but it was still damp in the morning. I set it out in the hot afternoon sun for a few hours (sorry don't know how long exactly), and it was dry. Perhaps the heat helps it set in? Some other readers asked about rinsing...I didn't rinse my chair, but that's definitely something you could try. I think that's actually how you're supposed to dye a shirt or something. I'd love to know how your project turns out! I am so thrilled about this idea. Purchased to two higher end Thomasville easy back chairs from a thrift that in their day were very beautiful. However the velour paisley is worn and faded. So I can not afford to redo until I came across your blog. One question I have that I do not see asked is any chemical residual smell? I am very sensitive to certain odors. One reason I refused to purchase the junk being sold in local retail stores from China. The out gassing can last a long time. Your chair is wonderful. I would have to remove alot of decorative furniture tacks or attempt to wipe clean..Great idea. Thanks..
Hey! I'm glad you're able to revamp your chairs now! I haven't noticed any smell whatsoever. If you are concerned, I'd recommend rinsing the chair after you dye it! I haven't done it personally, so it may lighten up the color some. I'd love to know what your results are! Your chair looks fantastic! I'm so excited to be able to change the color without changing the texture of the material! One question though - I can see how you could rinse the cushion covers, but how would you rinse the actual sofa? Hi DIY Addict! :) If I were rinsing it I'd probably have to trial and error it. I'd wait until after the dye dried completely. Then start with wet towels and just scrub the surface area to try and get any excess color off. If I wasn't happy with how that turned out, I'd try taking a spray bottle full of water to re-wet it. Then use some old towels to try and sop up the color/moisture. It's possible you'd have to do this several times to get most of the extra dye out. OR if it is a small piece, like this chair...I might be just lazy enough to spray it down with the water hose and just keep spraying it until the water ran mostly clear! haha! Of course, it would have to be done on a nice sunny hot day so it can dry through quickly to avoid any musty wet smells! Let me know if you end up trying it!!! Love your idea of using dye…One thing I'd like to mention…Whenever I use Rit Dye for jeans, etc. it says to use very HOT WATER & by adding some vinegar to the solution, it helps set the dye…in a washing machine I'd use about a cup of vinegar…so in a Spray Bottle you'd only need a little…I always rinsed in cold water…also when completely dry…Spray upholstery with a can of Scotchguard..let air dry..in a hot room or outside the hotter the better to set the dye!! I tried this and my loveseat is crunchy. Did I do something wrong? How can I fix it? Hi Anon, I'm not sure why it would be crunchy. What type of material is the loveseat? Did you measure the dye to water ratio correctly, using HOT water? My best advice would be to sand the loveseat. I know people who have painted their upholstered furniture and don't like the crunchy/rough feel after sand it and are much happier with the result. The fabric is a ribbed velvet? I actually brushed it and the crunchy is gone and it make the color more true. Its so pretty! Thank you. Looks fantastic. I'm thinking of dying some microfiber chairs, but I hesitate a bit at "soaking" the upholstery with a spray bottle. The instructions for shampooing upholstery and carpets always warn against soaking the fabric because that may cause mold to grow under the surface. How did you guard against this possibility? I think it was really in the timing of the weather. I believe I mentioned in the post that I put it out in the hot sun to dry. It dried really quickly in the heat, so I think that squashed any possibility of mold growth because that requires certain circumstances to facilitate growth. i.e. prolonged moisture and humidity. :) Also, this chair didn't have super thick cushioning, so it was easier to ensure that it dried all the way through! Hope this helps! I think it would be interesting to try dyeing fabrics with acrylic paints. This summer I dyed some stringy decorator fish net that way. I needed it to look blue some I mixed up some acrylic colors in a bucket of water. I dipped the netting in it , squeezed it out and draped it out to dry. Why not mix colors with water and put it in a spray bottle and dye the same way written above. When it dries, it won't rub off. Oh Carrie that's a good idea! I wonder if it would work just as well. Do you think I could use this same technique on my corduroy style couch? I have slip covers for all the back and seat cushions and then i would have to spray the couch down with the dye. This couch is huge by the way! But i was thinking of also going over the couch afterwards with my shampooer and just warm water and giving it a quick wash down for any excess dye so that it doesn't transfer over when someone sits on it and might be damp or wet from rain. I would try it! However, I would wait until warmer weather and set the sofa outside to soak up some sunshine to prevent any mildew forming inside the thick cushions! Hmm that's a tough one. Maybe try getting it steam cleaned? Blast out the dirt with just water! Thanks for this creative and genius idea . Over the years I've recovered many pieces of furniture , but the piece I am going to do next has left me puzzled because it's a mid century modern chair that requires more technical clean and seamless preciseness that I think would be too difficult for me to do. Your method seems like the perfect solution . I look forward to seeing the result , and if it turns out well I have a feeling this wont be the only piece I will do. I've always wanted to reupholster something, but i honestly don't think I'd have the patience for it! Definitely going to try this on my brand new custom cornice boards. Epic fail on fabric color choice, should have gone with a darker camel/mushroom color. Maybe this will save me from having to recover them. Fingers crossed. Definitely going to try this on my brand new (and $$$) upholstered cornice boards. Epic fail on fabric color choice, needs to be much darker. Fingers crossed. Thank you Vivaciously! Follow up question: it looks like you used a regular run-of-the mill spray bottle? Trying to avoid buying a spray machine if I can avoid it. A little concerned about uneven color saturation is why I'm asking. Thanks again. Yep, it was just a cheap spray bottle. I think the saturation was even because it absorbs across the fabric, not to mention I really wet it good!! This is too good to be true. Just dyed a velvety type chair red. It is now dry, and it looks great, but dye is coming off on hands and all over white cat. Just rinsed out out a test piece and all dye came out. There is a reason why RIT does not really recommend. I'm sorry that's happening! Try setting it with a hair dryer. I've read the heat helps set the dye. The only time mine came off is when something wet was placed on the chair. I baked my chair out in the hot sun during summer for a full day. Perhaps it is the heat that makes all the difference! :) Hope this helps! What color blue did you use on the chair? Thanks!